The Japan earthquake and tsunami has created a ton of news stories about auto parts shortages, factory shutdowns, schedule interruptions and shipping delays. Throw in rising gas prices, and you get a perfect storm of panic buying as U.S. consumers make a run on fuel-efficient vehicles. The situation has led to severe price gouging by dealers on several models, including the Chevy Volt and Nissan Leaf. Automakers around the world depend on the Japanese automotive industry for most of a vehicle’s electronic components. In the aftermath of the Japan earthquake, the global automotive industry is especially sensitive to disruptions in the supply chain because of the “just-in-time” manufacturing practice of tight inventory management that was pioneered in Japan. Some automakers were caught flat-footed when they discovered vital components were produced in the Japan earthquake and nuclear disaster zone. Major U.S. auto parts maker Delphi recently identified at least 20 auto component suppliers within a 100-mile radius of the most serious earthquake damage. According to Goldman Sachs, the global automotive supply chain relies heavily on the Japanese automotive industry for rubber and plastic products, as well as semiconductors and microcontroller technology. The North American impact of the Japan earthquake and tsunami includes a warning from Toyota that it will not fill any orders of short-inventory parts. Ford and and Chrysler are discouraging orders from dealers for vehicles in some shades of black and red because of shutdowns at a plant in Japan that manufactures metallic pigments. Production shutdowns in Japan have disrupted supply of the Toyota Prius hybrid, the Toyota Yaris, Honda Fit, Mazda2 subcompacts and several other fuel efficient vehicles. As the Japan nuclear crisis drags on, uncertainty about when the supply of Japan-built cars will resume is beginning to drive up demand and prices for certain vehicles. 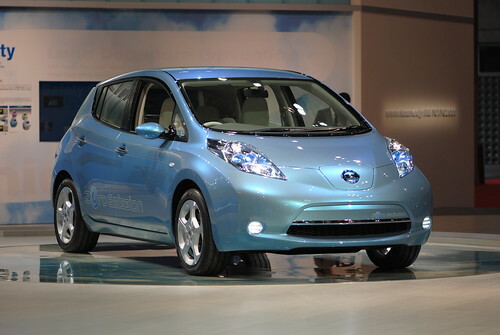 The Nissan Leaf, which normally goes for about $25,000, comes with a $5,000 premium in northern California. Another California dealership recently offered a Chevy Volt, which goes for about $40,000, for $61,000. Shortages of fuel efficient vehicles such as the Leaf and Volt could last up to six months, according to automotive experts. Consumers should hold off on buying as long as possible. When the summer driving season arrives in a few months, gas prices are expected to exceed $4 a gallon. Instead of buying a high mileage car at or above the sticker price, it could be smarter to simply slow down — or walk or ride a bike instead of driving in certain situations. When the global automotive industry gets back to normal, customers who bought cars at a premium during the panic will feel cheated or just plain stupid.